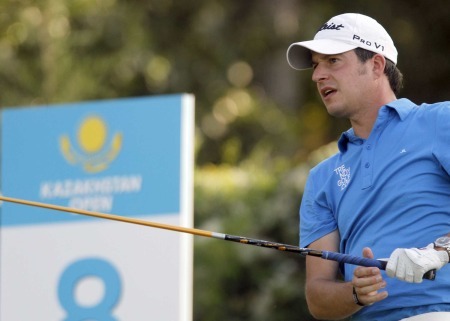 The County Down based professional put nerves aside to open with a four under 67 in the €160,000 Roma Golf Open - the penultimate event of the Challenge Tour season. Tied for eighth after the opening round, Thornton’s goal is not just to finish the season inside the crucial top-20 in the Challenge Tour Rankings who earn automatic promotion to the main tour. He wants to walk away from the 45-man Apulia San Domenico Grand Final in a three weeks’ time ranked inside the top-10 who will earn choice tour cards for 2012. Currently 15th in the Rankings, €8,540 behind 10th-ranked Frenchman Edoard Dubois, Thornton knows that a couple of top 10’s or a tournament win would see him achieve his goal. Those finishing from 11th to 20th in the Rankings will also earn playing privileges on the big tour next season. But they will be ranked further down the pecking order, behind the 30-plus players who will earn cards at December’s Quailfying School finals and will therefore find it more difficult to get starts in the bigger European Tour events. That makes this week’s test massively important and with €25,600 on offer for the winner at Olgiata Golf Club, 20 miles north of the Eternal City, 34-year old Thornton doesn’t need to be told what’s at stake. Four shots behind Frenchman Anthony Grenier after the opening round, Thornton said: “I played very well today and am delighted with the score. It is that time of the season where the nerves come into play and everyone is a little on edge because of what is at stake. “I know what I have to do to get into the top ten at the end of the Grand Final – anyone that tells you they don’t look at the Rankings at this time of the year is lying. Thornton might want to share his pearls of relaxation-related wisdom with countryman Colm Moriarty after the Athlone professional posted a frustrating level par 71 that left him tied for 50th. In need of a top three finish to join Thornton at the Challenge Tour Grand Final in three weeks - and avoid a trip to the Second Stage of Q-School - Moriarty will have to go low over the next three days to achieve his goal. Dubliner Niall Kearney posted an opening 80 and looks likely to miss the halfway cut after ending the day dead last in the field. At 108th in the rankings, the former Walker Cup player must now head to Stage Two of the Q-School. He was exempt from qualifying for PQ2 thanks to his category 14 ranking on the European Tour.